Tonight’s dinner was super easy, delicious and healthy! The following recipe makes enough for two people (4 halves in total). Stab sweet potatoes all over with a fork then bake in oven on a tin foil lined oven tray for 45-60min or until soft. Whilst the potatoes are cooking, dice and mix the salsa ingredient together and set aside – I allow you to do as you please for the remaining 40 or so minutes. Once the potatoes are done, using a sharp knife, gently cut each sweet potato in half. Next, use a spoon to scoop out most of the sweet potato flesh from each half into a small bowl, leaving just enough flesh intact with the skin for the potato half to keep its shape. Slightly heat chilli beans in the microwave or in a small pot on low heat then gently mix beans and spices with the removed sweet potato flesh. Scoop mixture back into potato halves then top with avocado salsa to finish. 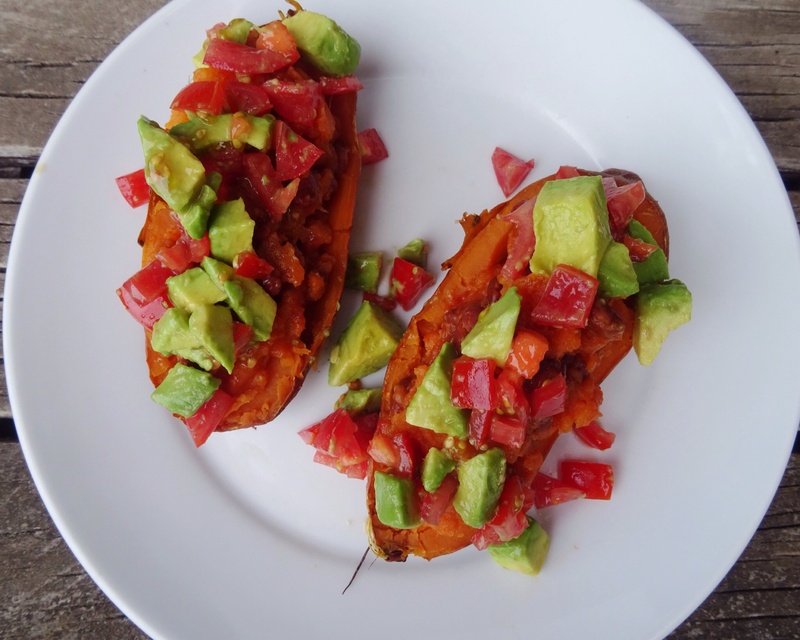 Alternatively, you can top filled sweet potatoes with mozzarella or vegan mozzarella and return to hot oven for the cheese to melt before topping with salsa! Mmmmm “satisfied” does not adequately describe how freakin’ content my stomach/taste-buds feel right now – oh Mama! Who, speaking of, also highly approved of this dish!